Boy, now aren’t these words everyone wants to here when it comes to working on your coach “Low Cost”. Well, there is low cost and there there is low quality which is a better deal is always the question. A low quality paint job hopefully will cost you less than a quality job, sometimes not. A quality paint finish by virtue of the time put into the prep and actual paint work will always run the cost up but there are some things you and the paint shop can do to keep the price low and still have enough quality to add value to your machine. This is what our page here is all about. 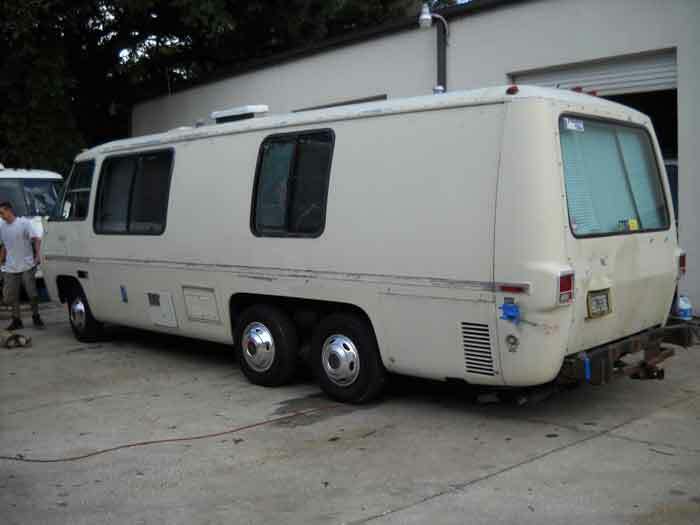 We will be doing a modest but quality exterior refinish on Lou’s coach. Lou will be dong much of the break down and some prep work himself, adding his own “sweat equity” to help keep the paid out cost down. He’s not cutting corners, just taking some of the labor off of the shop and doing these things himself. 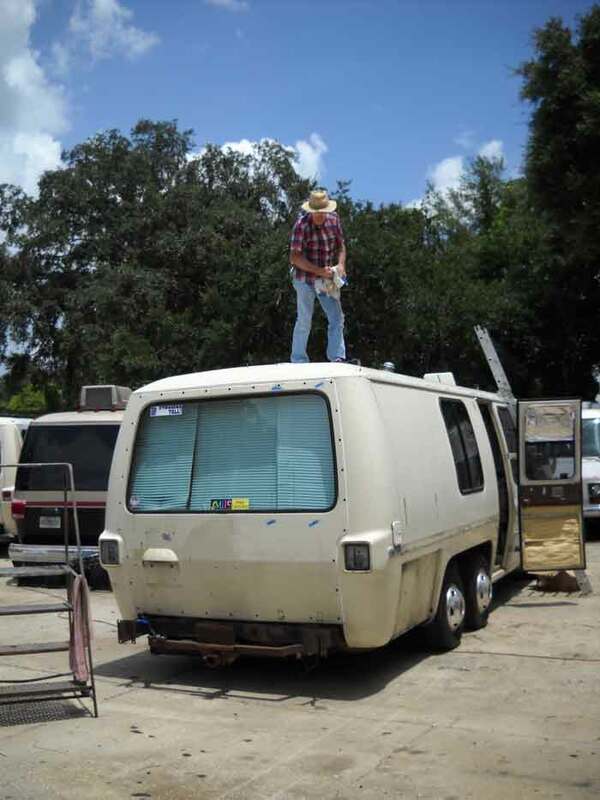 We are happy to help him and you if you like to have an exterior refinish on your coach like this. This is not a “cheap” paint job rather a low cost quality one. Follow this project and let us know if you are in fact interested in doing a project like this with your coach. 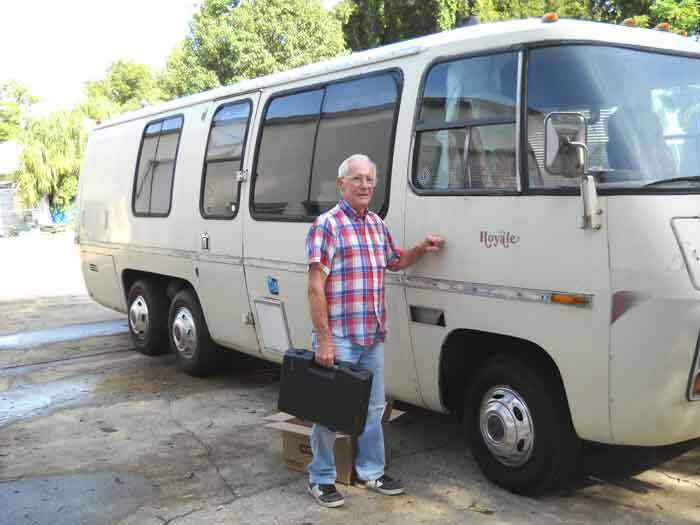 Lou has been working on his coach for some 6 months now on his own, removing decal stripes, accessories and all that sort of stuff in preparation to bringing the coach over here to us. 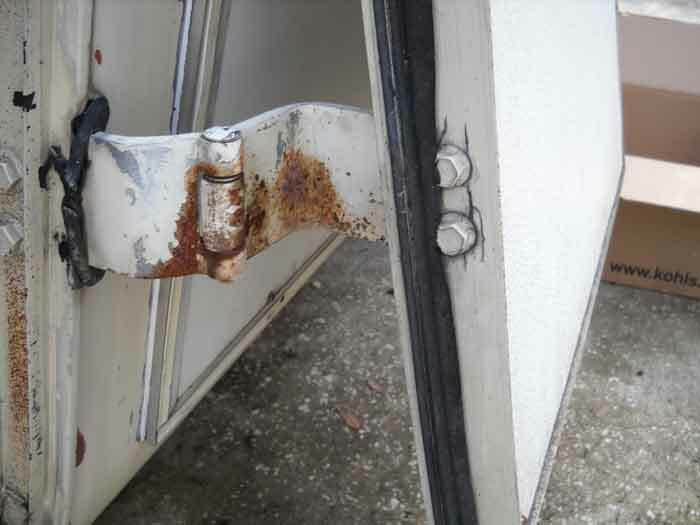 He has worked for a couple of days here at the shop doing some final prep work before setting our guys loose on the coach His lower main door hinge was damaged , you can see the cracks on the door side channel. We had that secured and while we were at the door, recurved the door to properly fit. Lou then removed the inner front wheel liners and ran the coach back over to the paint stall where the guys would be doing the DA work. We are shooting for a $4200 paint job. 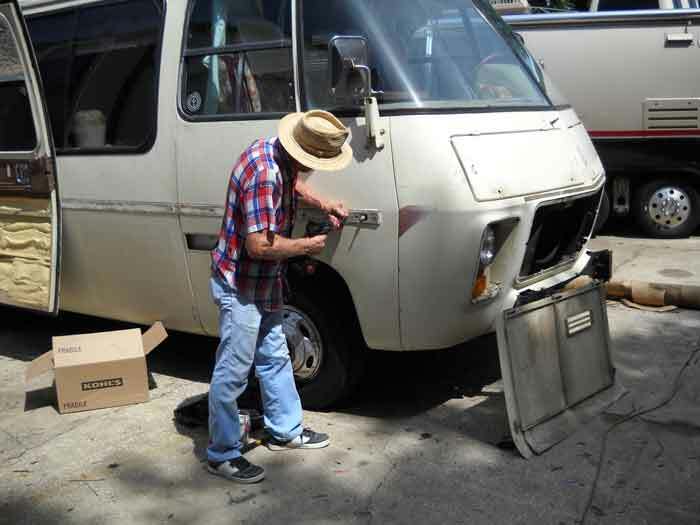 The prep work, recurving the door and fixing the lower hinge will of course not be included in the final job cost, these are things Lou did (with our help) to prep the coach for us.